I love, love, love being an entrepreneur and working for myself, but I have to admit a lot of the time this lifestyle is very glamorized. Not a lot of people talk about the hard parts of working for yourself, such as isolation, financial stress, loneliness and feelings of self doubt. With that in mind, I wanted to come up with a self care checklist that contains must-know self care practices for the girl boss! Self care is all about taking care of yourself physically and emotionally. It’s about finding things that you love to do and that light you up and making time for them. It’s about really taking care of your mind and body and making choices that will benefit your wellness in the future. 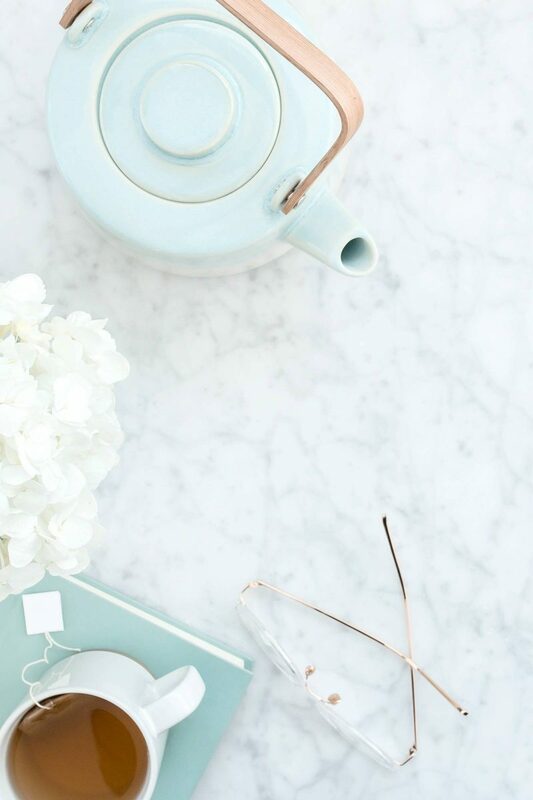 If time alone taking a shower, making a cup of tea and reading a good book helps you feel rejuvenated, that’s a great form of self care. If a girls night with your besties watching movies and ordering pizza gives you life, that’s also self care. We need different things on different days, but what’s most important is to stay away from things and people that don’t serve us, and do lots of the things that bring us happiness, wellness and joy. Self care is also about doing some things you may not want to do, like vacuuming and cleaning your bathroom. You may not want to do these things in the moment, but it will make you feel so much better when they’re done. If you think self care is all about taking eucalyptus baths and going for manicures, I hate to burst your bubble. 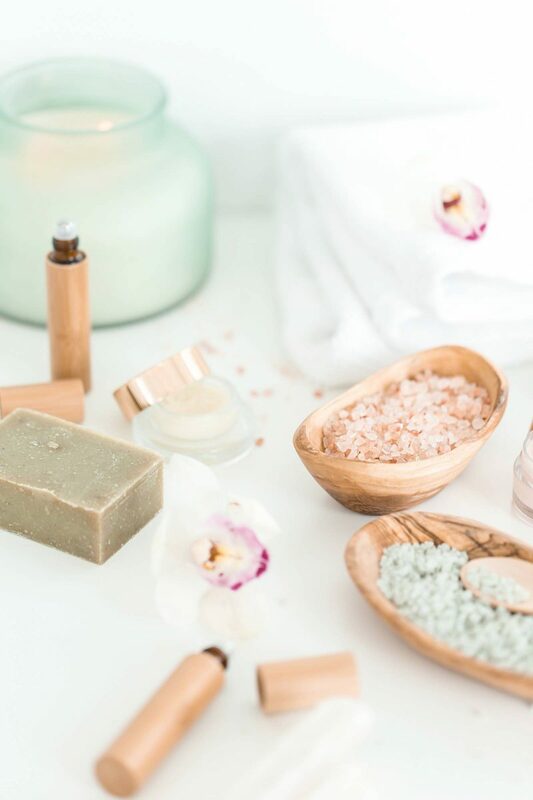 Self care has conventionally been linked with consumerism, but that’s not how you should be thinking about it. People recommend to go out and buy things like chocolate and bath salts to make yourself feel better, and while I do think indulging from time to time can be a good thing, it’s exactly what self care isn’t. 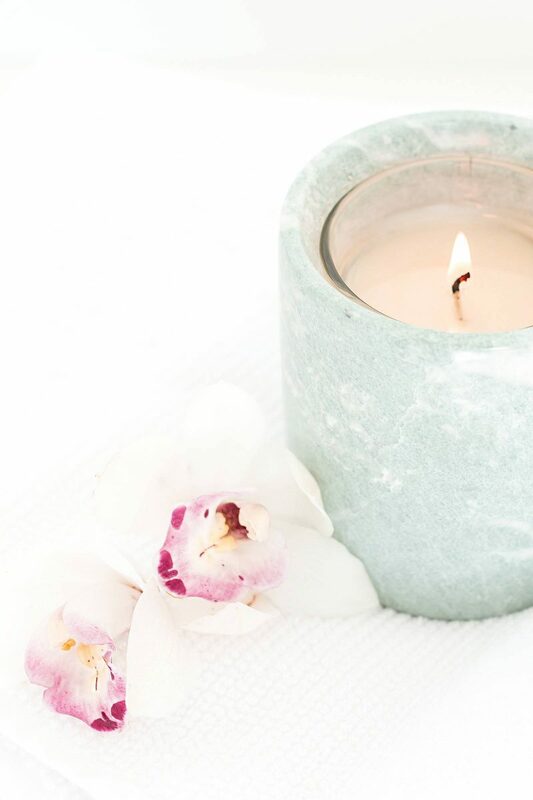 Real self care has less to do with treating yourself and more to do with making the right decisions and choices for your long-term wellness, especially as a girl boss. It’s all about learning how to take care of yourself, rather than trying to “fix” yourself. It’s about choosing a life and a day-to-day that really feels good to you and doing the things that foster and elevate your mind and body. If you want to get the most out of self care practices for the girl boss, you have to learn how to schedule self care. One of the main thing entrepreneurs struggle with is having the time to cross off everything on their to do list. After all, you may be thinking, how can I have time for self care when I don’t even feel like I have time to brush my teeth in the morning? When you’re scheduling time for self care, actually take the time to write it down in your agenda. Find a gap in your schedule and MAKE time for self care. Schedule it in and treat it like any other commitment in your day planner. Stick to it and don’t bail! How does self care reduce stress, you ask? It forces you to take care of yourself. A lot of the time we have so many responsibilities and commitments that we put our needs on the back burner. But if you’re not taking care of yourself, stress has the power to completely absorb you. If you’re mentally and physically exhausted, you feel depleted and you’re much less likely to handle stress in a manageable way. On the flip side, if you’re feeling great physically and emotionally, you’ll be more resilient and better able to handle any stressors life throws your way! 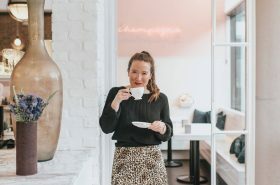 As I mentioned in the intro of this post, the girl boss life is often glamorized. Many of us focus on showing the highs of entrepreneurial life like working from cafes, taking vacations whenever we want, lap top days on the couch, or meeting up with other entrepreneurs during the day to work together. 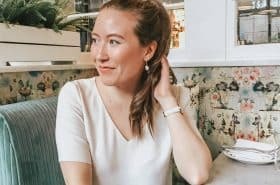 It’s good to focus on the positives, but I want to bring more light to the struggles that female entrepreneurs face and the important for self care practices for the girl boss. This year more than ever before, I’ve been struggling with feelings of isolation and loneliness as well as comparison. Money issues can also cause major source of stress. Luckily I’m in a good place financially right now, but there have been times when my financial situation wasn’t going so smoothly. And it’s extremely stressful. I know other entrepreneurs struggle with this a lot. It’s tough not knowing if your clients will be there next month or if your income one month will carry through to the next. Comparing yourself to others can also be so damaging, and while it’s easy to say just don’t do it, it can be tough. When there’s tons of posts popping up on Pinterest about bloggers who make $20,000 a month and photos of influencers on Instagram who are traveling around the world, comparison can come in hard. Take some tips from the ultimate girl boss, Sophia Amoruso in this video by LivestrongWoman. But try your BEST to stay in your own lane. Don’t compare your beginning to someone else’s middle and be so, so grateful for where you’re at right now. And of course, focus on taking care of yourself. Caring for your body and mind tells you and others that you value YOU above all else. 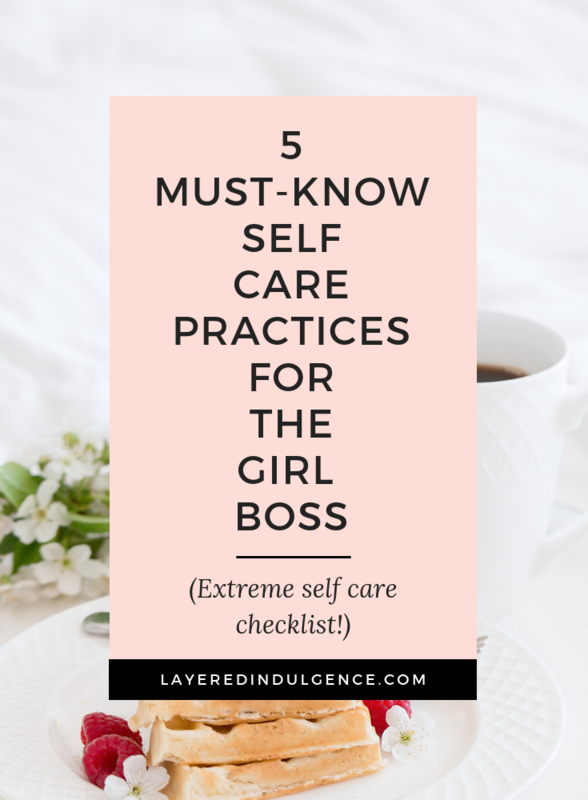 Here are 5 practices you can consider for girl boss self care, but remember, do what feels best for you! Your success and productivity relies on how rested and energized you feel throughout the day. When I’m tired, there’s no denying it, I just don’t function anywhere near my best. Getting proper, quality sleep ensures your emotional and physical well-being, and helps you handle stress, be more productive and function at your best. Aim to get 8 to 9 hours of sleep a night and go to bed at a reasonable hour. Just because you can wake up at any time you want, doesn’t mean you should be going to be at 3 am and waking up at noon. Exercising has a great way of boosting your mood! Whenever I’m feeling down or unproductive I head to the gym or do an at-home yoga class on Youtube. Exercise boosts your physical and mental health, so it’s important to get your blood flowing and heart pumping as much as you can. As an entrepreneur and someone who works from home, it’s easy to stay in your pyjamas or sweatpants with no makeup on all day. I admit, I used to do this. But recently, I starting getting fully ready every morning and it’s made a world of a difference. When you’re in pyjamas or sweatpants, you’re prone to feeling lazier. Getting ready makes you feel more productive and ready to go if you have a last minute invite or need to run out to the grocery store. I call this showing up for myself, and I think all girl bosses should do it. I still dress in comfortable clothes (I never put on jeans because they’re not comfortable to me). I usually wear comfy trousers and a nice top and do my hair and makeup. It really does make a huge difference in making me feel more productive. It can be super isolating to work on your own everyday. One of the best self care practices for the girl boss is to actually get yourself out of your house and being social. It’s nice to work by yourself from time to time, but when you’re stuck inside all day on your own, it can really start to take a toll. Meet up with other entrepreneur friends if you can or at least go to a cafe so you have some human interaction. 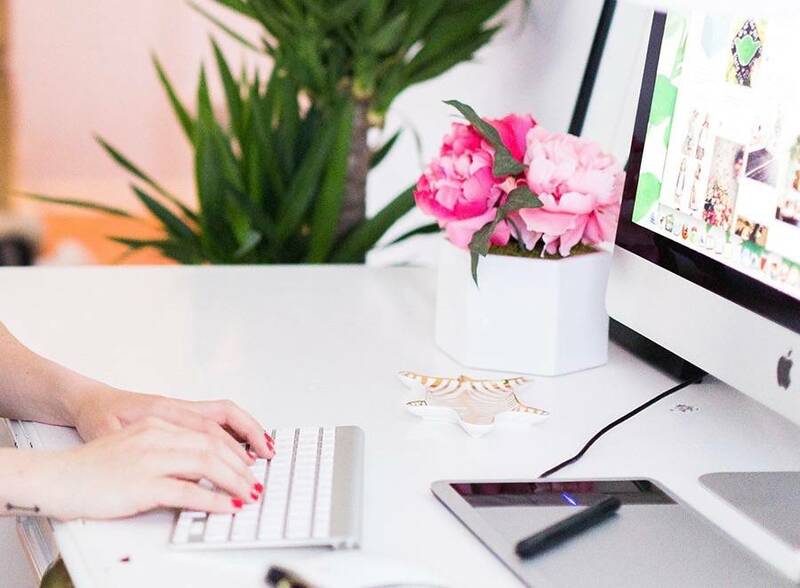 If you’re an entrepreneur, you’re likely staring at your screen ALL day. And for some, scrolling social media could make up a big part of your job. When you’re constantly online and on social media, you consumer just as much (if not more) content than you create. It’s important to get away from others’ ideas and opinions, take a break from emails, and step away from scrolling Instagram. Time away from tech will allow you to reconnect to the things that are most important to you and give you a break from non-stop work. Self care is often done from the comfort of your own home. If you’re wondering how to do self care at home, check out this video by Fusion of Cultures for a few easy steps to take! The self care checklist is so important for female entrepreneurs. 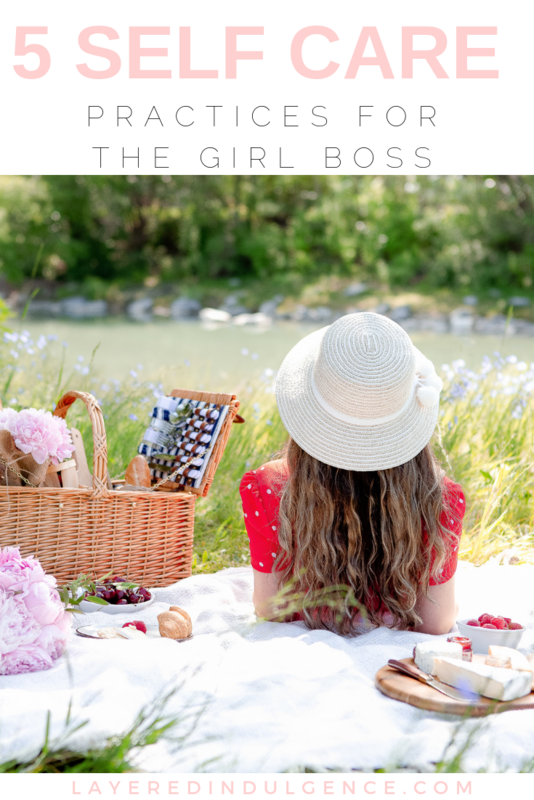 Use these self care practices for the girl boss on a daily and weekly basis to feel your best! If you loved this post, I’d love if you shared the image below on Pinterest!